I apologize for the delay in getting this post up, but here’s a summary of my last birding excursion, this past Sunday. My last visit to the Malabar Scrub Sanctuary was memorable, in part, because of how close I got to some Florida Scrub Jays. To be honest, my main goal was to see some of these birds again. The sanctuary itself is divided into two main parts, an eastern and western section, with the Cameron Preserve in the middle. This forms a more or less contiguous open space ranging from low scrub to mature second-growth forest. I started the morning in the western section, nearby the Turkey Creek Sanctuary. This part of the park is mainly forested with a semi-closed canopy. Northern Parulas were numerous and vocal. Almost everywhere I saw or heard Northern Parulas, Yellow-rumped Warblers were nearby. The males are molting into their breeding plumage and are looking quite sharp! The warblers tended to move through the trees just ahead of Blue-gray Gnatcatchers. The Northern Cardinals are ramping up their activity as well. Most years, the cardinals in this area only show a slight decrease in activity through the winter. Some years I have even seen fledgling birds in late January, meaning at least some of these birds are nesting and breeding through the winter. This year, however, the cardinals have been more laid back and quiet through most of the winter. Things are changing now, though, and soon I expect these handsome birds will be singing and chirping their way to distraction, as always. At one point, I heard a distinctive bird-like chatter up in the trees and looked up at some tall pines, trying to find what was making the sound. I heard a similar response about 100 feet away in another treetop, but could not see anything. The first noise came from a tree with a nest in it, though I could not tell if the nest was occupied. The nest was 2-3 feet wide and make of sticks. I’ve embedded this video below, mostly for the sound recording. If anyone knows what this is, please let me know. Mysterious chattering call. Does anyone know what this is? I heard several small groups of American Goldfinches at various places, and the constant calls of the Carolina Wren at times challenged the cardinals for predominance. In both sections of the sanctuary I heard White-eyed Vireos singing their odd, semi-mimicked songs, but the one I did see was too quick to grab a photograph (if you follow this blog, you’d know it took almost a year for me to actually photograph one of these birds, despite hearing them almost the entire spring and summer). After completing one of the loop trails through that part of the sanctuary, I drove to the eastern portion, where I saw the scrub jays last year. They did not disappoint. After one “false alarm” by this Northern Mockingbird, I was visited by a couple of jays, who let me get quite close and seem to be people watching as much as I was birdwatching. Perhaps I was being silently mocked? 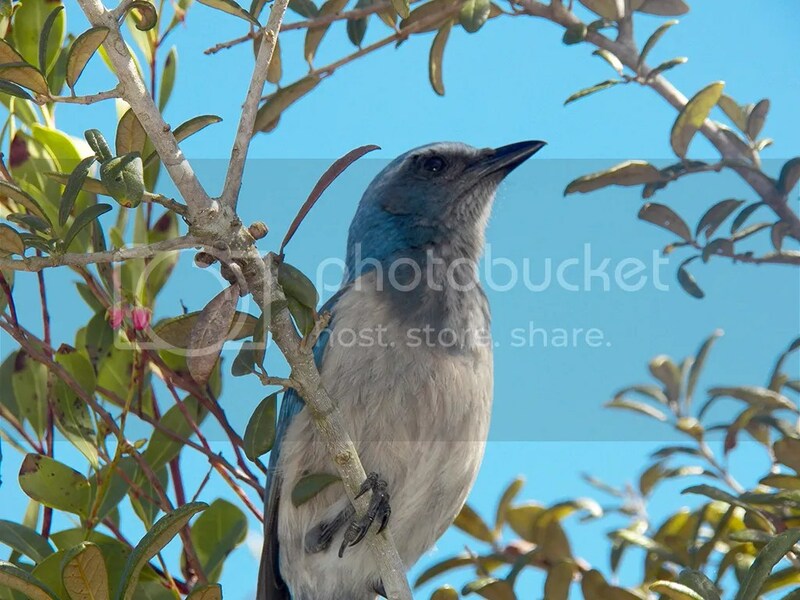 Florida Scrub Jays are intensely curious birds, and also quite social (like most corvids). One pair hung around the tree I was near, trying to catch a glimpse of a bird that was noisily rustling in the brush along the trail. One of the two let me get within a few feet of it (the rustling turns out to have been Eastern Towhees foraging in the leaf-litter). When I said, “I don’t have any snacks for you,” this bird actually did turn up its nose. Further along the trail this bird followed me and let me get closer and even take a short video. The video starts when the jay notices a large wasp flying around. The loud sound at the end is the camera’s zoom mechanism. Florida Scrub Jay goes after a wasp (not in frame). When it flew off and ran around, it was chasing the wasp, which it then summarily caught, dismembered and ate after scurrying into the brush. I managed some photographs after the meal was complete, but I love the picture shown here because it shows off the beautiful blue plumage on this handsome bird. Florida Scrub Jay after just eating a large wasp. After a few more minutes, the jays got bored with me and flew off (I heard several other individuals in the vicinity). During the wildlife festival in January, a group of us were talking about various state birds, and it was mentioned that Florida’s state bird is the Northern Mockingbird. I offhandedly said I voted for the Swallow-tailed Kite, but Laura Erickson immediately piped up and said, “I think it should be the Florida Scrub Jay.” And she’s right. 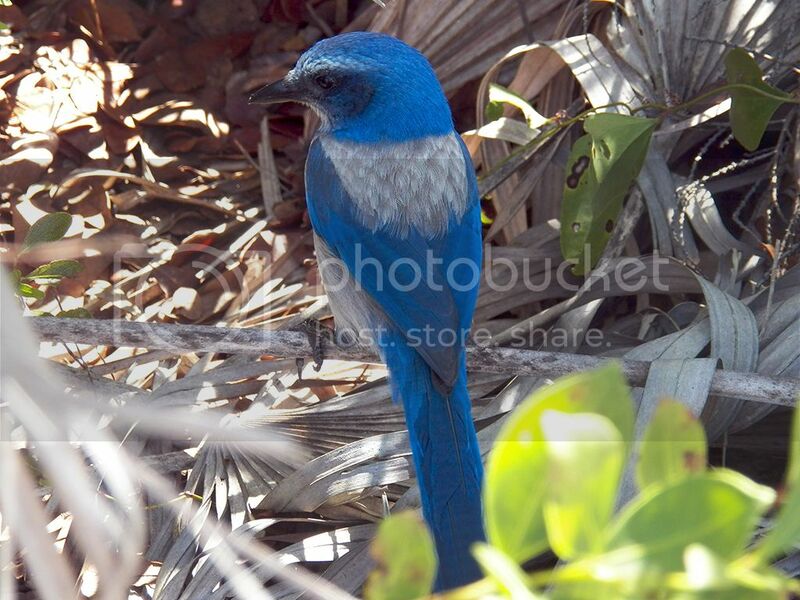 The Florida Scrub Jay is completely endemic to the state. No other Florida bird is as emblematic of the struggle in Florida of wildlife and open space vs. development or of natural Florida vs. the tropical paradise we’re trying to force it to be. While it might lack appeal for citizens for whom the Scrub Jay is not found nearby, any benefit the species might get by elevating it to official status would be welcome, in my eyes. I finished up the morning by walking to the end of the paved road before turning around and walking back out. One pleasant surprise there was a trio of Brown-headed Cowbirds on the powerline. 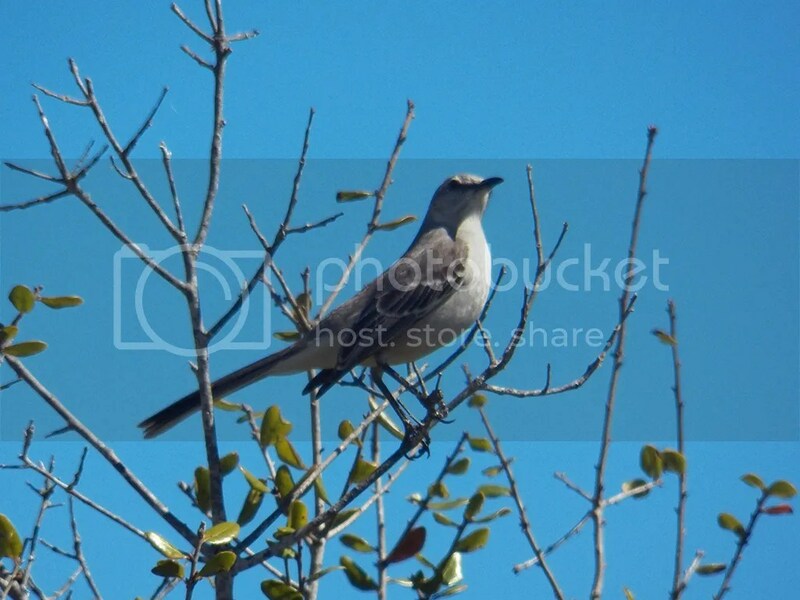 Posted on 2014 March 4 by Lonely BirderPosted in BirdingTagged Birding, birds, Florida Scrub Jay, Malabar Scrub Sanctuary. Next Next post: What was that, Bill?